JoAnne has provided us with the venue and will also provide a snack. Can someone volunteer to provide a beverage? Just email me. We have papergoods. A speed round of Show and Tell because we have a lot to cover this month! We will share the Asbury Challenge finished projects, photograph them and vote. The popular winner will receive a copy of In the Studio with Angela Walters. We will discuss the newly announced membership plan for the MQG. I "attended" a Webinar about the changes this past week and will share the details. And finally, I will show how you can use EQ7 to design quilt blocks and quilt layouts. I hope you will come with lots of specific questions to guide me. Feel free to interrupt as I go with questions too. Topics for the August meeting forward have not been decided yet. If anyone has a demonstration that they feel comfortable offering, please let me know. If there is a topic you'd like to see discussed or demonstrated, please also send me an email. I will compile a list for discussion at the next meeting. Our meeting was held in Stratham today, in a great meeting room, thanks to Paula. We started off with show and tell. Above is Laura's flying geese quilt. Paula completed her Twister project from last month's meeting! One of our MANY new members today shared her quilt as you go linen valences. I am certain that I don't have all the new members names yet...I think that this is Michelle? Please correct me if I am wrong. I am thrilled to say that Robin fell in love with paper piecing at the Dec. meeting and pieced this star! Here is a lucky new member (Mary I think???) who attended QuiltCon and took Angela Walter's quilting class. And finally, Becca shared her paper pieced block from the Quiet Play quilt along. After show and tell, we dicsussed charity sewing. Laura agreed to take the Sew Fresh Fabrics charity quilt top, backing and batting and finish up that quilt for donation. (Peg, please contact her about that!) We discussed the possibility of making pillowcases with drawstrings for children taken into foster care to put their belongings in. We were concerned about the idea of drawstrings combined with later use as a pillowcover. We decided to simply make pillowcase and perhaps add velcro to some to serve as bags, or the children can just gather them together and hold them but they will have a nice pillowcase later to remind them that someone cared. We will be sewing as many as we can at our July meeting. Jo Ann will lead a quick demo on a pillowcase making technique at that meeting. Fabric requirements will be sent out in June. Asbury challenge charm packs were handed out to 16 members. We will bring those back to the next meeting and vote on a winner as we did with the Madrona Road Challenge. Samantha Russell is organizing a Kokka swap. She took some names and will be sharing pictures of 12 fabrics soon, on Facebook, the Flickr group or here. Finally, we discussed our next meeting. 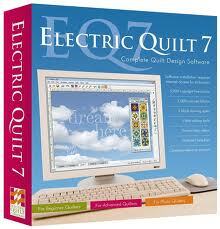 We will meet in Hampton in April to discuss Electric Quilt Software. Come with questions! If you have suggestions for meeting topics please email me. Diane mentioned discussed blogs and growing your blog, etc. Please feel free to suggest other topics or topics that you feel you could lead a workshop on as well. We then had a quick demonstation of the Sizzix Big Shot. Everyone had a chance to cut bottle or Drunkard's Path pieces for a pillow front and I did a quick demonstration on how to sew both. Poor Rhonda had to take an emergency dentist appointment tomorrow morning so you are all stuck with me (Amy) for the "curves" workshop. Because I don't sew curves by hand, we are going to change the plan a bit. I am going to bring my Sizzix die cutting machine and a couple of dies. You can bring your precut material and feed it through the cutter to cut enough fabric for a pillow cover (that will allow everyone a chance to use the machine). You will have two choices. You can either cut Bottle shapes or Drunkard's Path blocks. I used the bottles to make the pillow above. If you would like to cut bottle shapes, bring your fabric ironned and precut into rectangles measuring 7" x 3 1/2". I believe that I used 36 pieces for the pillow above. I'm sure that mot of you are familiar with the Drunkard's Path block. It can be arranged in a number of ways. I used it in one of the more traditional ways in the pillow above. 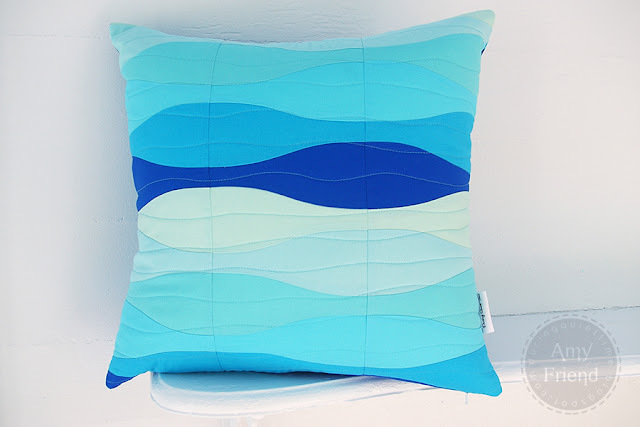 For that pillow, I cut 16 quarter circles and 16 backgrounds. A quick google search will give you many ideas. For Drunkard's Path blocks, you should cut your fabric to 8" x 4 1/2" to cut a set of 2 quarter circles. Cut your fabric to 6 3/4" x 5" to cut a set of two background pieces. If you would like to bring your machine, you can begin assembling them at the meeting. I will demonstrate how to assemble both blocks. Please help out by bringing extension cords. I will bring two power strips, an ironning board and iron. There is no need for cutting mats or rotary cutters. We have a number of important things on our agenda so I hope we will have a good crowd. We will be talking about charity quilts, a possible Kokka swap, and handing out fabric for the next guild challenge.